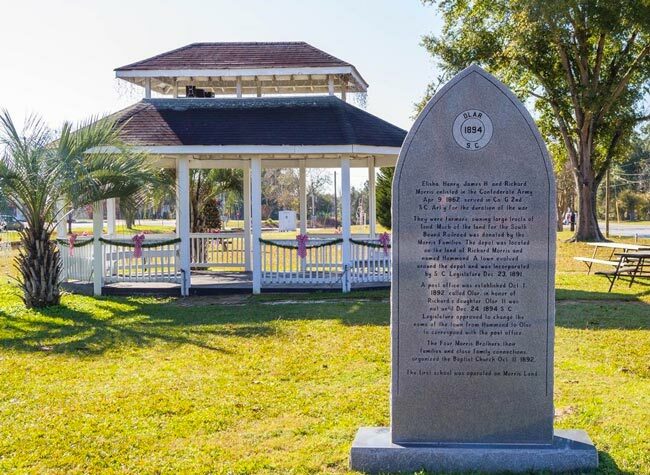 This granite marker in the Bamberg County community of Olar is dedicated to the town’s founders and tells a brief history of the village and how it got its name. Olar was first called Buford’s Bridge for the bridge built by Colonel William Buford over the Salkehatchie River in 1792. Yet at the end of the nineteenth century, four brothers and Civil War veterans – Elisha, Henry, James H., and Richard Morris – owned large tracts of land in the area that they donated to the South Bound Railroad, which would pass throughout the community. A depot called Hammond Station was subsequently built on Richard Morris’s land, and the town that grew around it, called Hammond for the depot, was incorporated in 1891. By October of 1892 a post office was in service in Hammond, called Olar for Richard Morris’s daughter of the same name. In 1894 the town’s name was changed to Olar in keeping with the post office. Olar is home to historic Mizpah Methodist Church, built in 1856 when the town was still known as Buford’s Bridge. Pictured above, the granite marker in honor of the Morris Brothers stands next to the railroad tracks and was dedicated by Morris descendants in 2000. 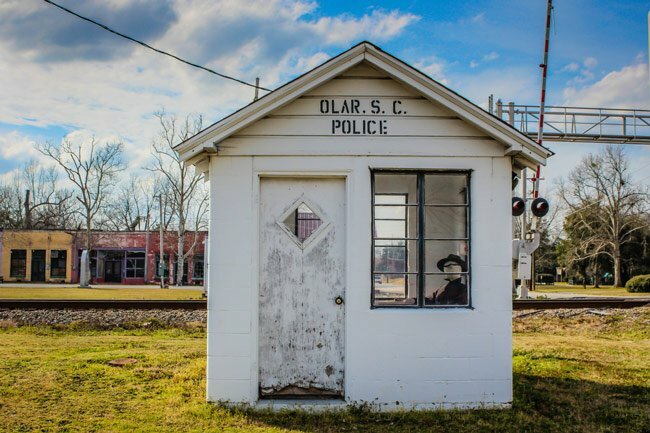 Though the police station in Ridgeway holds the title as world’s smallest, the former public safety building in Olar gives it a run for its money. The shed-sized building seen above operated until the later part of the twentieth century, with one police officer occupying the station. 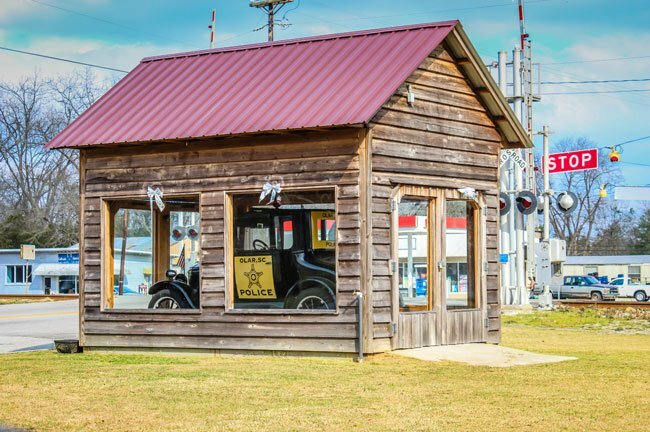 Today a modern police station serves the community, but the former tiny police house remains in the center of town as a nostalgic reminder of simpler times. The classic police car pictured below also harkens back to a different era and is the impetus of the Olar Model T Festival held each October. The antique police car leads the festival parade of Model T’s, Model A’s, and tractors. According to local lore, Olar businessman C.F. Rizer invested in a Ford dealership – the largest in South Carolina – in 1913, shortly after the advent of the car. Prior to the dealership, Rizer had proven his business acumen by successfully selling general merchandise, buggies and accessories, and farm equipment. After he expanded with his Model T dealership, apparently Henry Ford himself reached out to Rizer and asked him to invest in the Ford Motor Company so he could expand manufacturing. Rizer invested $25,000 in Ford, which resulted in the production of half a million cars by 1914. A train with 64 box cars delivered 256 of these cars straight to Rizer’s dealership. Rizer then focused solely on selling Ford products for the remainder of his career. Though not an original Olar police car, the Model T seen here stands on display in town. The bank building seen below, thought to have been built around 1900, was operated by C.F. Rizer. 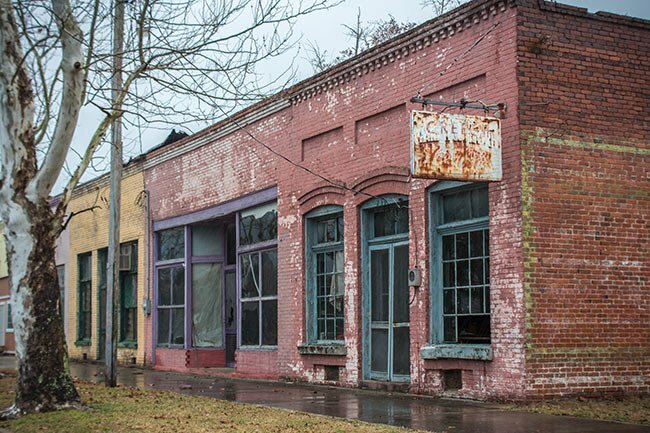 A string of closed businesses harkens back to the thriving times of Olar. Flanking the end closest to Highway 64 is the old general store known as Creech Variety Store, its name faintly seen on the rusty hanging Coca-Cola sign hanging from its corner. 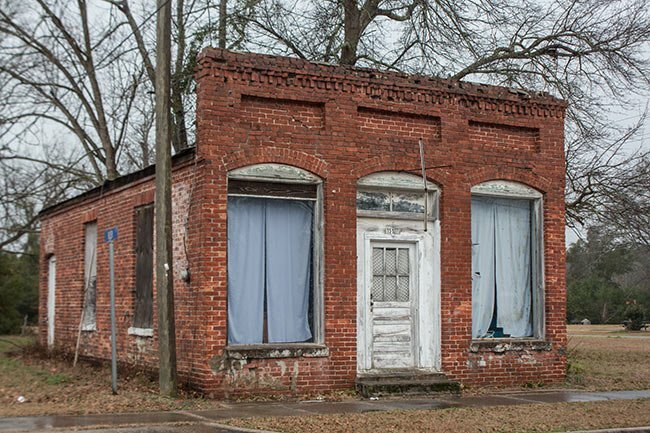 Established in 1938 and facing the railroad tracks that once helped economy of the town, this store provided the town with many of its most common provisions needed for daily living. I visited Olar many years ago as a guest of E.D. Bessinger. I fell in love with the little family run stores. The town was a breath of fresh air from city life and I thoroughly enjoyed visiting and talking to the town members. We can certainly try and get something added on about the school! Which school in particular was it? Really enjoyed seeing this post but would have also liked to see a picture of the school! I miss the people of Olar – such an important part of my life.